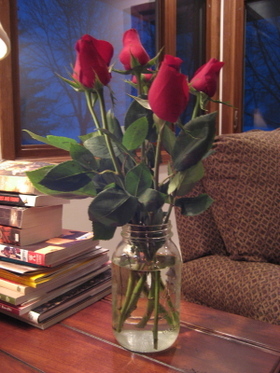 What's in that pretty jar? Milk kefir, from a local source. It has been the object of my search of several months, almost under my nose. Craigslist to the rescue! Now to see if my grocer still carries organic whole milk. Of course, I'm adventuring when the high temperature is forecast to be 8 degrees F with nasty wind chills. I found a salsa verde that I really like. Mmmmm. I'm taking a break from preping/packing for our annual deer hunting venture. DB Eric is in the state and ready for anything. I've been listening to Nathan Lowell's Trader Tales serialized podiobooks lately. I just listened to the first episode of Full Share, which is third in the serier. I have also purchased the first three books in electronic format. Mr. Lowell narrates his books and is very easy to listen to. I got the audio free via iTunes but they are also available free from another site, which I am too busy to link to. I'll be in my tree tomorrow enjoying the pre-dawn, dawn, morning, mid-morning, etc. Wish us luck. If I can get a signal, I'll try to post an update. The internets were down at my house last night but that got fixed. Unplugging and hitting the reset button several times does so work. White Dot is recovering from being his alter-ego, Fight Dot. He's looking much better now. Fighty got to visit the vet earlier this week, though. Have a safe and happy hunting season all you hunters and a happy Thanksgiving. Here's to the beginning of a nice four-day, relaxing weekend The relaxing theme was foreshadowed earlier this week when I met with Vicki at Kaukauna Coffee and Tea. I'm glad we were both available Tuesday since it was a bit of a last minute call to let Vicki know I was in her part of the state. We enjoyed coffee and then dinner and a lot of conversation.....but no knitting. What is this, three in a row for me? Vicki's daughter, Ali, manages the coffee shop. The shop has a relaxing atmosphere with excellent coffee and a very yummy turkey and havarti panini. There's interesting artwork on the walls and a nice balcony at the back of the shop where you can sit and enjoy the river view. Go there if you are in the area, you'll enjoy it. I stopped in for a cappuccino Thursday morning and there was a good group of what looked like regulars at the front tables. Yes, I may be slightly biased because I had an enjoyable visit there with Vicki but I travel alot and this is a genuine find. Today will be filled with some shopping, a massage, a car wash, and going to the greenhouse in search of some vegetable plants. There's some bread in the oven right now and the weather should be gorgeous. I've been making bread the 5-Minute artisan way since DH gave me the book for Christmas. Today I had a loaf in the oven while I was packing my suitcase. There was a loud noise and when I took the bread out, the cause of the noise was very apparent! Oops. The bread is delicious. The stone was old and not as thick as suggested but it served me well. I'm in DC this evening and 34 degrees feels balmy. I hope I feel the same way in the morning. Here's a bit of Friday's Blue Sky, captured before it was hidden by more cloudy weather. We think about 8 inches of snow fell by noon yesterday. The sun was nice and bright for an hour or three then we were back to clouds. More snow is expected this weekend. DH and I are off this morning to my maternal side's traditional lutefisk and lefse celebration. Don't worry, there are also venison meatballs and the other seasonal goodness. This meal is certainly a nice food example of my Norwegian and American Indian ancestry, although the venison meatballs didn't get added to the mix until my dad married into the family but I won't tell that story since I need to hurry up and I'm starting to get off topic. Cincinnati, it must be Wednesday. Dh and I are attending a meeting here and we are staying downtown. It is a very nice downtown with cool restaurants and Fountain Square with a TV screen the size of, oh, Godzilla on the side of a building. Since we are FoodTV addicts, we set off to find some Cincinnati-style chili. 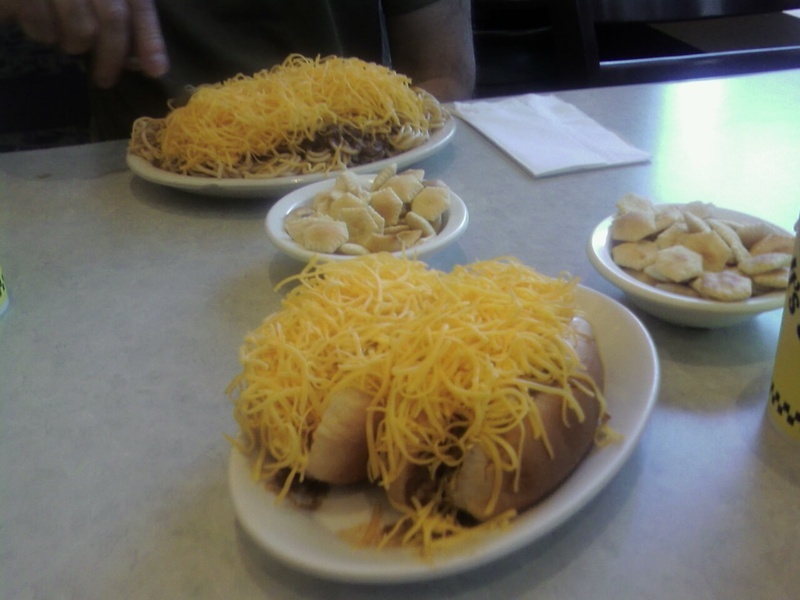 This evening we tried Skyline Chili. (Sorry for no links, I'm posting from my 'phone.) I ordered Coney Dogs and DH had the classic 3-way,which is (keep it clean!) on spaghetti. Both dishes were great, even with the mountain of cheese. There is a hint if cinnamon, nutmeg, and perhaps chocolate in the chili. I cannot confirm that since the recipe is secret. DH and I are going to enjoy a nice venison pot roast dinner with a nice bottle of red wine. Now, when I say nice bottle of wine, my usual qualifications for a bottle to win that would be to have a pretty label and taste pretty decent. (Think Trader Joe's) However, I have friends who have higher standards for the fruit of the grape. DH and I are lucky enough to have some wine on hand that met their standards (and has a nice label) and goes well with venison. I'll see about pulling that out of the basement wine cellar. Once again, snow is falling in my part of the world. Nature is generously adding an inch or three to the weather people's initial forecast. (I am so glad I did not go into the field of meteorology for my career! I am not suited for not hitting the mark, day after day.) We may get about 8 inches of more snow today. The drive home was a bit earlier and slower than on a sunny day but uneventful. Thank goodness. Heaven. I slept past 7 AM this morning, which is an hour-plus past my normal wake-up call during the work week. I love weekends with no "events"---they seem like a luxury. I love event-filled weekends, too, but variety is lovely. Coffee is a part of my morning routine that I really enjoy. However, I've been trying to kick my addiction to a speciality creamer that contains partially-hydrogenated fat ---- so today I'm trying a bit of honey as a sweetener with a bit of milk. Not bad. Certainly better tasting to me than sugar. In our township, there is a central location for garbage and recycleable drop-off and it is open Saturdays all year. We've left our old light fixtures there and someone else has recycled them into their house. Well, today, DH came home with a treasure. Someone, most likely a woman, started this tablerunner embroidery kit and there was a matching kit for four napkins. I wonder about the circumstances of how these items became trash to someone. Did someone pass away or was there another reason for this work to be discarded? I think the completed work is lovely. 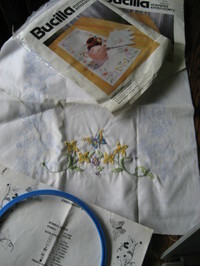 The embroidery floss for the rest of the table runner is missing but the instructions are complete and list the colors, so the floss should be replaceable. I believe I will add this to my list of projects to work on and complete. I hope the unknown crafter would like that. 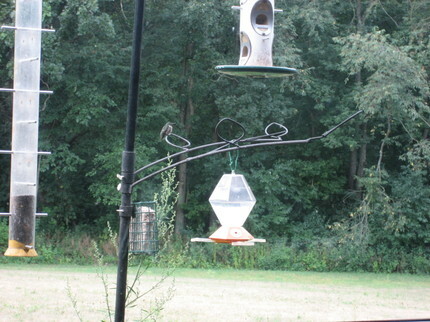 Here's a fun photo of something you don't often see---a resting hummingbird. Well, the crowd (so to speak) is gone for now and I spent the day teleworking. 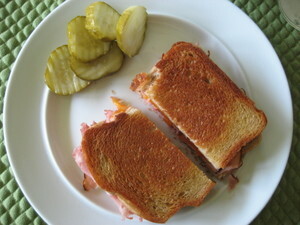 Here was my yummy lunch of grilled ham and medium cheddar on light rye bread with a side of bread and butter pickles. After work, I watered the vegetable garden and the herb garden. Gosh, is it ever dry! The oregano is flowering but was looking very sad and wilty. I looked later this evening and the plants are looking happier. I guess I let that task go a bit too long, didn't I? 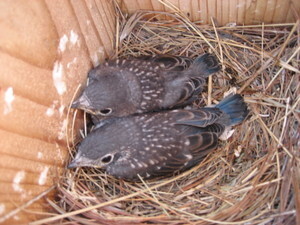 After watering, Dan and I did a little bluebird house snooping and here is what we found. There were three about a week ago so we are assuming they are starting to fledge out of the nest. Summer goes so quickly, I suppose I'll be seeing ripe tomatoes soon. I woke up this morning and, with some fear, twitched the hotel curtains apart and looked. No snow! I thought: Great! The forecast was wrong, which is fine. So, I made some coffee, read a few blogs, then got ready to go to work. Then I peeked out the window again. Drat! Snow....and it was blowing. Lunchtime rolled around. There's a bunch of white stuff in the air and on the sidewalk. Sigh. I bundle up and walk over to the Rochester Deli. I've mentioned it before. Today, I enjoyed a bowl of minestrone. I brought a cookie back with me. Here's the parking lot scene at my hotel about 5:30 pm today. Wet, heavy snow. A scene of Spring. Riiiiight.